This time of year we hear the same thing from most everyone we run into–the craving for fresh, green food is intense for those folks eating mostly what they grow themselves or from the farms around and about them. There are greens to eat in the winter here if all goes well, but they are not really green, they are overwintered. They sit through those cold, dark months of December and January, freeze and unfreeze often, and wait. We harvest what grew before all of that, and it is usually not pretty nor tender. They are greens that beg to be cooked. By now, our desire for green is for fresh. And new growth is happening, it feels like finally, after all that wait. Fresh leaves are making there way to our plates again. The greenhouse is fully planted and we are working arugula thinnings into our salad mix. Before we know it, there will be lettuce again! 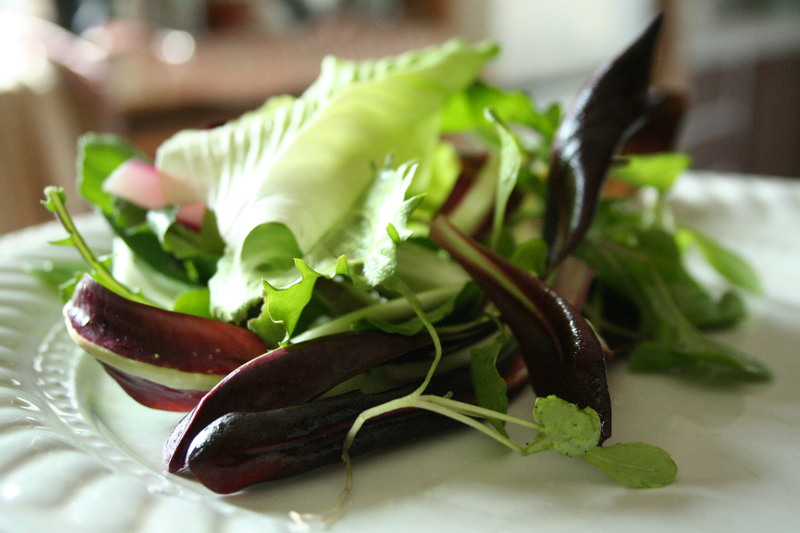 But while we wait for the traditional and tender lettuces to be in the mix, what is fresh in February and early March make me quite happy to eat. More than happy…I almost don’t want to move on. The inner leaves of sugarloaf chicory are as easy to eat as lettuce but with so much more to offer, I may love them more than anything. And the smaller, spoon shaped inner leaves of radicchio are so sweet and bitter, royal and right. The mid -summer lettuce leaf salads really can’t compare with the mix of colors and textures of right-nows green salads, except that we love those for all the other fresh vegetables that are able to join in on the fun. I sit down to eat this salad every day and the sight of it, its beauty, steals my heart. And then I do bite into it and the flavor is almost too much, it is so good. After roasted roots and meat, and cooked kale and collards, all winter, my body sings kind of like the rest of the animal kingdom outside. The birds and the frogs and I are enlivened right now. And I am over the moon in love with my plate. Just as I am with one thing or another, each season, in its turn. Rapinis will come soon to sweep me off my feet, then peas. Peas! Then summer, the season that rarely offers itself monogamously, will bring so much to love it is ridiculous (and why we love it so). Then come autumn-year after year after year–arugula will bring me to my knees. And delicata squash, oh my! Osaka purple mustard. Tat soi. Even come next winter, I will sing, again, the survival instinct that cabbage and turnips inspire in me. Then, the whole wild love-fest will begin again. It has been seven years for us out here on this farm, that same length of time since we learned about our food allergies. Our diet is so different now. But it is also so simple and so good. All the pleasure it brings feels like the same natural pleasure the earth itself takes in bringing it forth for us as it circles around the sun. These love affairs I have, they feel so nourishing and healthful, that is how I dare say eating should be. This is not to say I don’t have my weaknesses (coffee), and not to say that we don’t eat some things from miles away every single day of the year in bland repetition (bananas). But the heart of all of our meals is this land. And there is more joy in that than I think we know until we are experiencing it. There are so many food movements, so much divergence in opinion. There are external factors and internal ones. I naturally shy away from dogma, I try to keep my vision clear and focas on myself…and those eating at my table each and every night. There can be so much confusion about what to eat, guilt over what you are eating, and so much that does not nourish you to pick up on the cheap. Whatever you choose, my hope, my own two cents on what it should do for you, is this–that it deeply feed your body and soul. Not in any one night stand kind of way, cheap and wrong even if it seems right in the moment. Deeply. My argument for seasonal eating, aside from any social-economic-political-environmental reasons is that this will be the side effect either way. And that this may just teach you, if you listen closely, how to eat as you need to in order to feel alive and joyful. Because chicory is truly and amazingly healthy to eat; but that is not the reason I came to endear it.